Laura is a PhD student at the Interaction Design Centre, commencing her research role for meSch (Material Encounters with digital Cultural Heritage) in February 2013. She graduated with a first class honours in B.Sc. Music, Media and Performance Technology. Her research interests lie in digital fabrication in social settings, digital cultural heritage, the connections between the digital and physical world and interaction design. 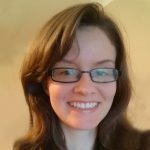 As a research assistant/PhD student, Laura will be part of a team exploring the construction of physical tangibles for communicating digital information in museum/exhibition contexts. Her current research for the project/PhD involves studying the role digital fabrication plays in the development of adaptable exhibits in social settings (in particular, the museum as a social setting). Her research is particularly focused on how multiple people adapt and built upon existing and new exhibits through digital fabrication. The overall project will result in the development of a platform for creating exhibit interactives with embedded digital information without the need of advanced technical knowledge.